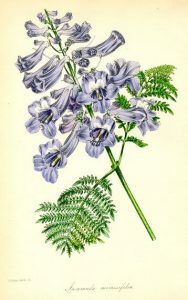 Our last guided walk of the year will be a Jacaranda Walk on Sunday 11 November. We’ll be strolling around our local streets and finding some of the best Jacaranda trees in the suburb – including some hidden ones you may not know about. As usual, we’ll finish with coffee or lunch at one of our local cafes. This will be a popular walk so please send your RSVP to members@huntershilltrust.org.au soon if you’d like to come along. Walks are free for Trust and Historical Society members and $10 each for guests. 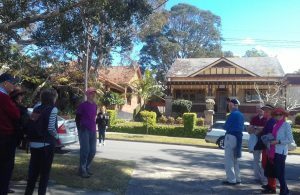 A lovely sunny day added to the enjoyment of our stroll around the heritage streets of Isler, Sunnyside and Hillcrest above Tarban Creek. Built on the former Isler Estate and auctioned as 129 residential blocks in 1913, many of these attractive homes are still intact and their beautiful gardens were sparkling in the sunshine. We all appreciated the enduring charm of their architecture and were intrigued at how a few years’ difference in construction resulted in small distinctions in style between Federation and Interwar homes. We heard some charming local stories from residents and learnt about the real community spirit of this area. What a treat for the HHT walkers. 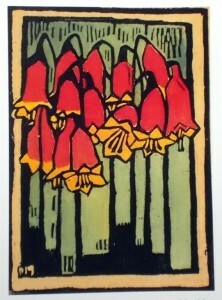 Our walk this month will take us through Riverglade Reserve to The Priory and around the streets above Tarban Creek. We’ll be looking at some of the fine examples of well-preserved Federation homes that are plentiful in that area. These ‘Contributory Items’ to Hunters Hill’s heritage are an important and historic feature of our suburb and we’re hoping to include many of them in our new Green Book update. 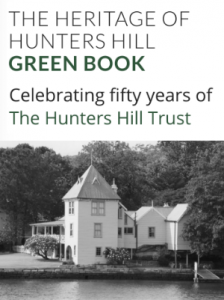 FREE for all members of the Hunters Hill Trust. $10 for guests. New members are welcome. provision for community facilities and access, pedestrian links and more. 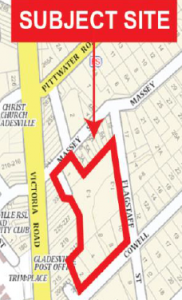 A lot will be riding on the proposed site-specific Development Control Plan and, if approved, how this links in with requirement for the review of the Local Environment Plan, new Local Strategic Planning Statements and further Master planning for the Gladesville precinct. Council expressed appreciation for the volume and content of submissions that contributed to Council’s capacity to provide their report to the Department of Planning. It all has a long way to go yet! The Trust and members of the local community have been concerned about the rapid deterioration of two historic weatherboard cottages at 1A and 3 Ryde Rd near the Hunters Hill overpass. 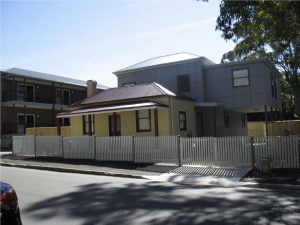 Council has told the Mainstreet Committee that the front verandah of 1 Ryde Road was recently demolished without authority. Hunters Hill Council promptly took the developer to court the next day and obtained an injunction. Heritage items like this need to be conserved. 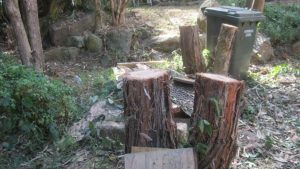 Hunters Hill Council has been successful in the Land and Environment court, winning cases against two Hunters Hill homeowners who together have been ordered to pay more than $150,000 for illegally cutting down trees in Barons Crescent and in Pains Road in 2016. Read more in the Sydney Morning Herald. How can we get better at conserving and adapting our heritage items? How can we get better at protecting, maintaining and adapting our heritage items? There are lessons to be learned from what happened to the Schedule 5 heritage listed cottage at 11 Mark Street. 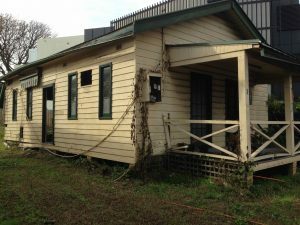 This small timber workman’s cottage became very dilapidated over many years, despite alerts from Council’s Conservation Advisory Panel (CAP) and the Hunters Hill Trust. The owners initially discussed demolition and creating car parking spaces but eventually proposed to demolish the cottage and reconstruct the front portion of it with a new building behind. The Council of the time ignored CAP’s detailed advice. CAP recommended that the hipped rear section of the building should not be demolished as it could be anticipated that the two storey rear addition would dominate the little house at the front. Sadly, this has proved to be true. The detail of the rebuilding of the front part of the house and the colour scheme have paid little heed to the original details of the fabric of the cottage. Read the sad case of heritage listed cottage at 11 Mark Street here. What does this mean today as we stand by and watch the two historic timber cottages steadily deteriorating on Ryde Road? The owner of the Gladesville Shopping ‘Village’ site wants to amend the local planning instruments to increase the number of flats that can be built on the Gladesville Shopping Village site. 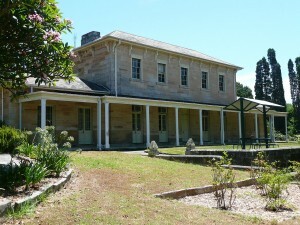 The site includes land that is currently a public access car-park on Cowell Street and the timber cottage at 10 Cowell St which was sold to the developer by the previous Hunters Hill Council. Current planning controls allow approximately 180 apartments to be built on the site. The proposed changes would increase that to 280 apartments. Council is proposing to build a ‘Livvi’s Place’ playground on the site of the existing, small playground in High Street near Montefiori in heritage listed Boronia Park. 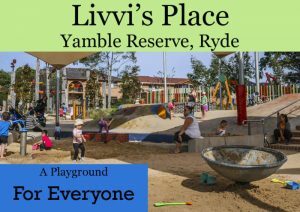 Livvi’s Place playgrounds cater for the very young and those who find it difficult to engage with many existing playgrounds. Why would Hunters Hill Council want to destroy a serviceable, existing junior playground? 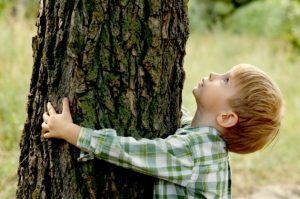 The recently agreed Boronia Park Plan of Management identified older children and young people as the priority groups needing playgrounds in Boronia Park. Livvi’s Place playgrounds are substantial constructions and involve significantly more maintenance than usual playgrounds as they include sand pits, water play equipment, paths to be swept of leaves and sand. A recent visit to Livvi’s Place playgrounds in Ryde and Five Dock showed equipment that had been taken out of service. The total cost of the project would be much greater than $500,000; the report to CM4443 puts the estimated cost at $500,000 + $200,000 to reconfigure car parking, and does not estimate ongoing costs of maintenance. Read the Trust’s submission to Council here.